Lexus says it doesn’t offer a sports car, but don’t for the moment believe it. Marketed as a “luxury sport coupe,” the all-new Lexus LC500 is simply a sports car in 2+2 guise. I became acquainted with this exotic beauty and its hybrid variant at a press event in Hawaii this past February, but as usual, my drive time was limited. Seven months later, the LC500 was weaved into my press fleet rotation, giving me a full week behind the wheel of this luscious cruiser. 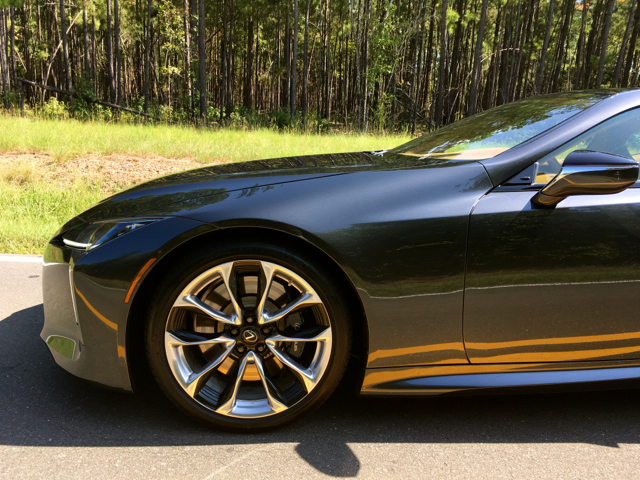 Lexus offers the 2018 LC500 in one grade with several packages and special options available. Priced from $92,995 (including a $995 destination charge), it isn’t too difficult for prices to exceed $100,000. By the way, the LC500h starts at $97,505 and is marketed separately. Some people find Lexus’ current styling language controversial, even ugly. The hourglass (spindle) grille is perhaps the greatest point of contention, but I’ve heard plenty of remarks about the deep body sculpting and radically shaped lighting elements. 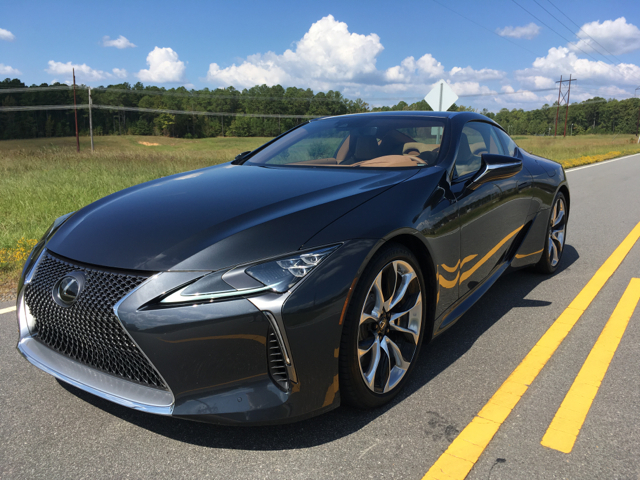 All those features are evident on the LC500, but in this case they suit this model just fine. Indeed, the front fascia is nothing short of intimidating with the lighting elements enhancing the drama. The LC has a race car feel with its long, wide hood, tapered greenhouse, pronounced side vents, and a powerful rear deck with a massive haunch. The boomerang lighting elements and stacked quad-tip exhaust outlets complete its persona. 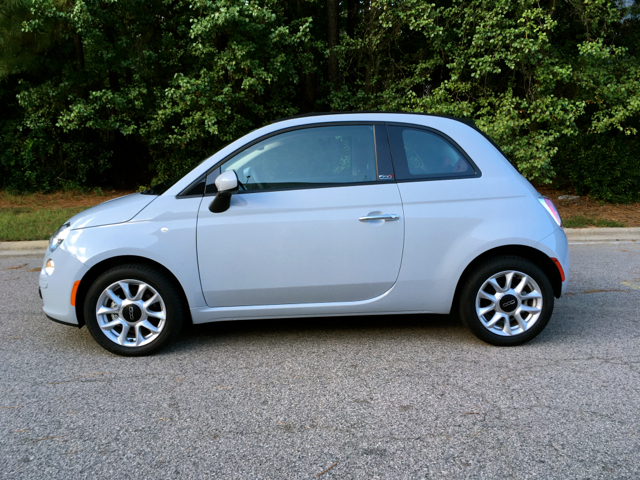 You’ll find 20-inch wheels or available 21-inch forged wheels. Puddle lamps and flush-type door handles with illumination are other exterior features of note. Inside, the cabin is dressed for success. Luxury and sporting success, that is. 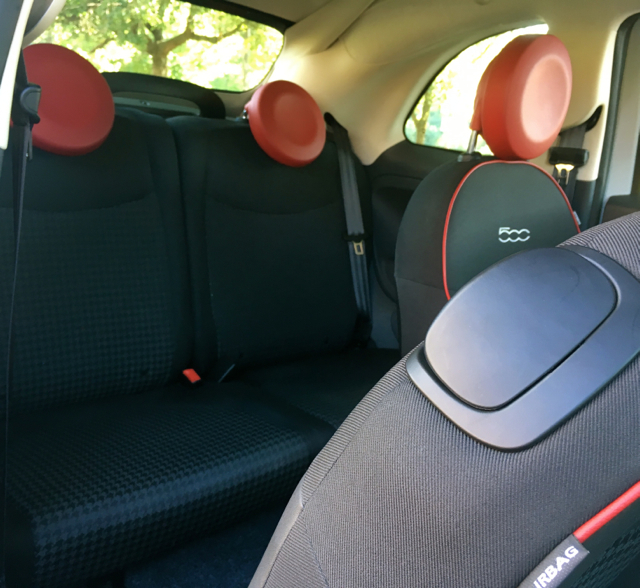 Though offering a 2+2 design, the rear seat is mostly an afterthought, something my youngest son can verify as he sat there while going to and from soccer practice. That meant the front passenger had his knees against the dash to accommodate my teen and that’s certainly not something you’ll want to make a habit. 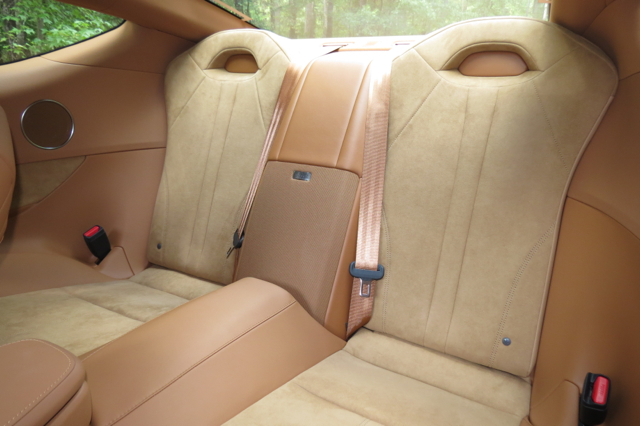 Chances are the average LC500 buyer wants this vehicle for himself or herself with a significant other riding shotgun. Just as it should be. Open the driver’s door and your full senses are activated. You’ll note the new car smell goes beyond the expected, offering a deeper, richer fragrance than you might find elsewhere. 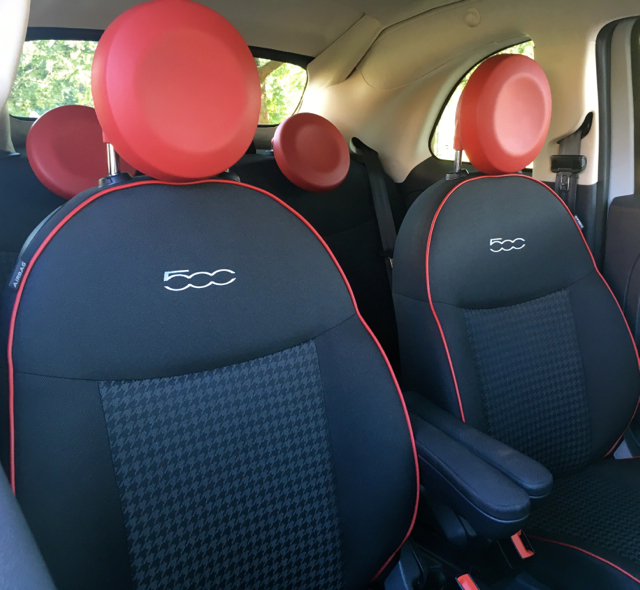 Slip behind the wheel and the comfortable, yet supportive seats embrace you. Scan the interior and you’ll find supple leather covering nearly everything, with carbon fiber and metallic touches also evident. My eyes were mesmerized by the electronic instrument panel and center console display, with both coming alive when the ignition was engaged. Bold colors and an artistically designed layout greet you. The interior layout is both luxurious and simple — the driver sits behind a slightly smaller than normal steering wheel with the expected driver-assist controls at the ready. The center compartment is the darling of the details with a long armrest doing double duty as a storage compartment containing a pair of USB ports and a 12-volt outlet. 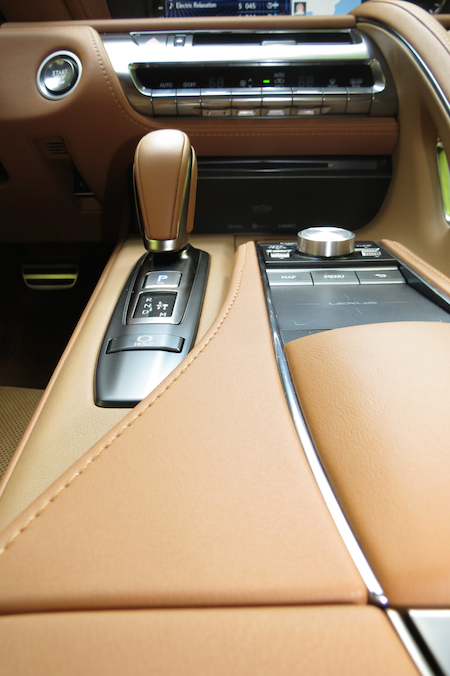 With everything tightly shut, the driver can place his arm with his wrist resting on the holder and the Lexus scratch pad supplying mouse-like control of the center screen. It takes some time getting used to the layout, but once you do, you can manage most in-cabin controls, while keeping your eyes on the road. 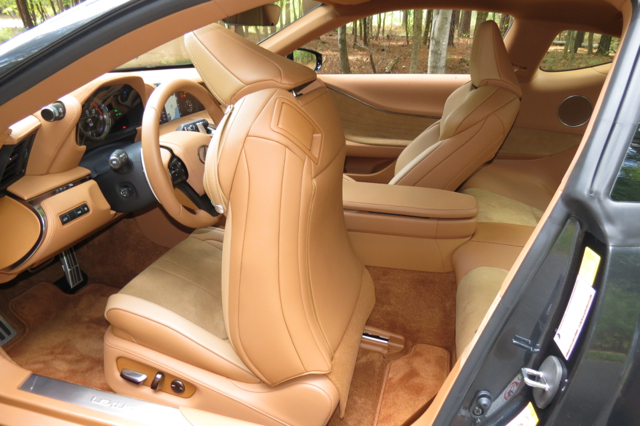 Other interior touches include aluminum pedals — accelerator, brake and footrest, 10-way power driver’s seats, LED interior lights, available heated and cooled seats, and a heated steering wheel. A 12-speaker Lexus audio system comes standard; a 13-speaker Mark Levinson package only enhances the experience. Unlike the RC, Lexus didn’t turn to its parts bin to create the new LC series. Instead, the LC represents the first of what’s certain to be several models based on Lexus’ new rear-wheel drive architecture (the LS is the second model). It is also the most structurally rigid Lexus yet, with more high-strength steel used than before. At the same time, aluminum is liberally used, as in the suspension mount and links as well as the door skins. Opt for the Sport Package with the Carbon Fiber Roof ($2,960) and this composite material tops the exterior. Otherwise, you can choose a Glass Roof Package ($1,400). Select the Performance Package ($5,960) and you’ll find carbon fiber scuff plates. 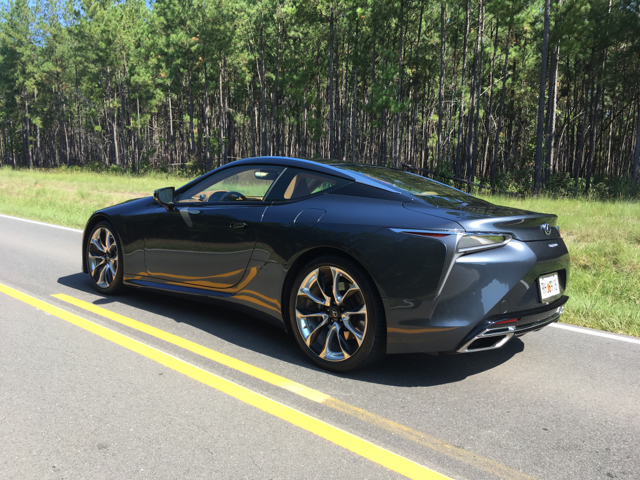 The engine powering the LC500 is everything to this luxury sport coupe. Thankfully, Lexus did not choose to go with forced induction and “settle” for the twin-turbocharged V6 now powering the all-new LS flagship line. I have nothing against that engine whatsoever — it is just that my preference is for a naturally-aspirated motor whenever and wherever one is possible. 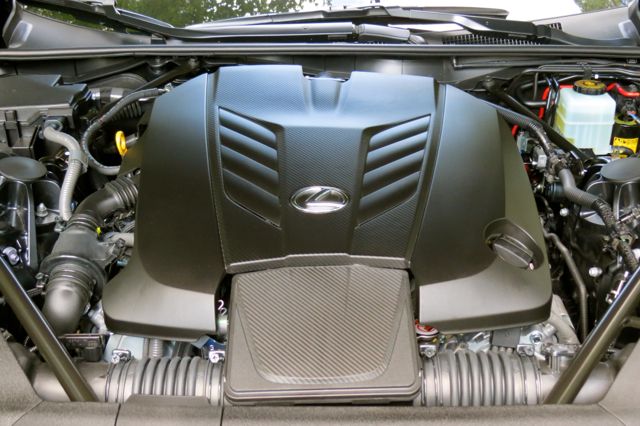 The 5.0-liter V8 is a familiar engine, also powering other Lexus models, including the RC F coupe and the GS F sedan. However, in the LC500, it benefits from variable valve timing with the fuel injected directly into it cylinders to achieve its high compression ratio (12:3-1) or into its intake ports, yielding delicious low-end kick. Lexus pairs this engine with a 10-speed sport direct shift automatic transmission with paddle shifters and manual mode. Sorry, you won’t find a manual transmission anywhere, so let us mourn…. That said, the LC500 is loads of fun! Feel free to paddle or stick shift your way to wherever the road takes you. Personally, I’m of the mind that if there is no manual, then I’ll go full automatic — why be disappointed with something that satisfies neither side of the drive equation? Making up for the lack of the manual gearbox is the drive mode controller, fixed to the top of the dash for easy turning. 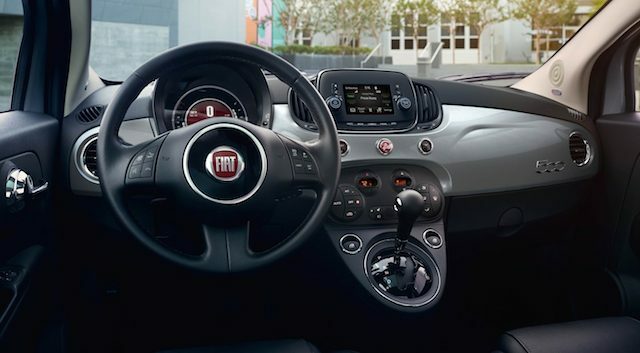 Here, you’ll choose Comfort, Eco, Sport S or Sport S+ modes. I’m sure I was in Sport S+ mode at least 98 percent of the time, what delivers weighty steering, longer shift points, and kicks up the exhaust system a notch. 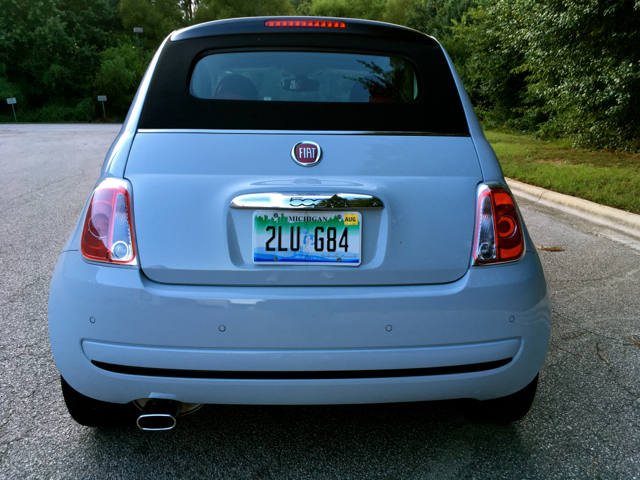 Oh, yes, the suspension system offers its own adjustments, supplying optimum connection between the car and road, although fuel economy takes a beating — I averaged 17.9 mpg in mostly highway and back road driving. Otherwise, this model makes an EPA-estimated 16/26 mpg city/highway. Engage the ignition and an immediate VROOM blows out the back. 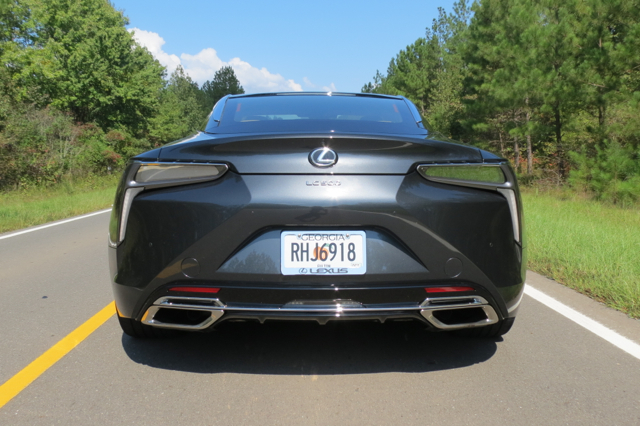 When idling, the LC500 is not much louder than your average vehicle — it’s when you press the pedal to the metal or let up on the same when the sport exhaust system is most active. Lexus says the LC500 goes from 0-60 mph in 4.4 seconds, although there is no launch control at work. 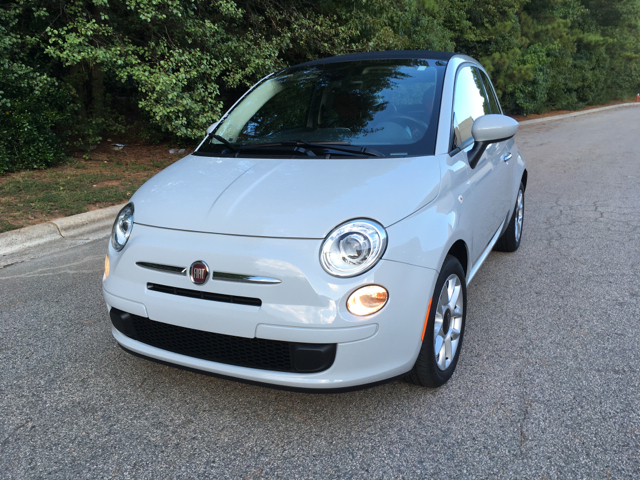 This car steers and handles extremely well, gripping the road and holding tight turns with authority. At high speeds (ahem) the LC500 underscores its street cred, nearly becoming one with the road. Wow, oh wow! That’s my short take on Lexus’ new sports car. It has the performance chops you demand, wrapped in an artistically beautiful package. 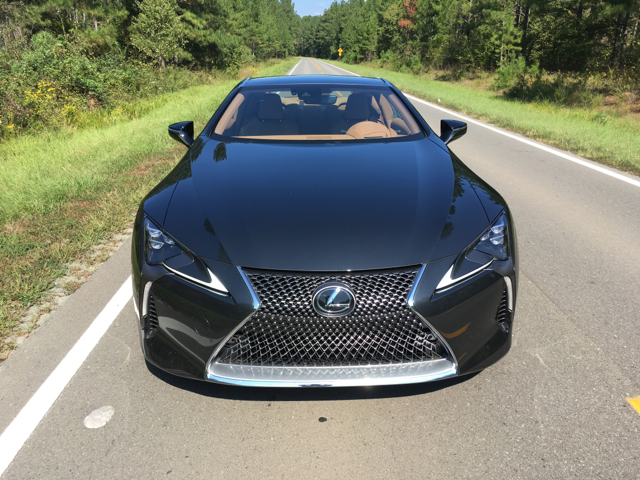 Although I made scant mention of the LC500h hybrid, it is no slacker, delivering 354 total system horsepower with its 3.5-liter V6 engine and two electric motors at work. It is a far more efficient model too, making an EPA-estimated 26 mpg in the city and 35 mpg on the highway — a 50 percent increase in fuel efficiency over the standard model. This means you’ll easily recoup your $4,510 hybrid investment. 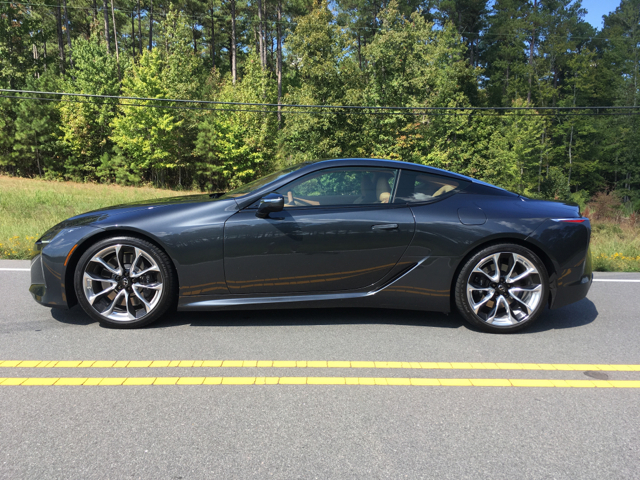 Doubtlessly, serious LC500 shoppers don’t face the same budget constraints of the average new car shopper when considering this model. Personally, I would go with the standard model and opt for the Torsen limited-slip differential ($390 — heck, yeah!) and the Performance Package, which requires adding the Convenience Package ($1,000) and the 21-inch wheels ($2,650), bringing your grand total to $102,995, what makes this a six-figure sports car.